As part of Show Racism the Red Card's 20th anniversary we have complied the information from all our Annual Reviews to find out just how many clubs, players and young people we have worked with over the years. I’d like to take a special moment to thank those teachers, educators and school administrators who were open to the idea of introducing SRTRC, and our materials into your classrooms. All our years we are taught to colour within the lines, never stray too far from our places of comfort. Without your own willingness to take that first step outside of your own ‘lines’ your students would not have been allowed to further extend their own selves." 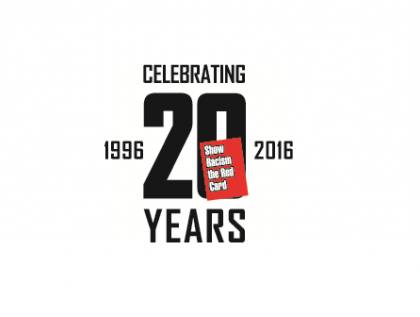 As part of Show Racism the Red Cards 20th anniversary we have complied the information from all our Annual Reviews to find out just how many clubs, players and young people we have worked with over the years. As well as highlighting some of the wonderful feedback we have had from teachers, young people and politicians alike. "It’s hard to believe that it’s been 20 years since I first started visiting schools around the North East with Show Racism the Red Card. I remember my first appearance alongside John Beresford at Gosforth High School like it was yesterday. To look at where the campaign is today and reflect on how far it has come, how many students have been given the confidence to look further than culturally imposed horizons, to express their own fears, concerns, and share in each other’s triumphs, has been the true reward of the thankless work of the hundreds of campaign workers, players, managers and volunteers through three decades. Women and men who themselves have grown through their own interactions with the kids over the years." "I’d like to thank the sponsors, contributors and those who have and continue to donate to the campaign. Your support cannot be measured in mere financial terms. How do you put a price tag on hope, encouragement and empowerment? "So as we go through the review of the last 20 years, take a moment for a collective pat on the back, you all deserve it. We all do. And when many may seem uncertain as to the challenges that may lie ahead over the next 20 years, if the last two decades had taught us anything it is that in bravely standing up to all the prejudice, bias and misunderstanding in today’s world we shall empower and be empowered, we shall grow and allow others to flourish, by embracing a greater version of ourselves we lay the foundation for a greater world tomorrow." "Here’s to the 20 years gone and to the next 20 to come."